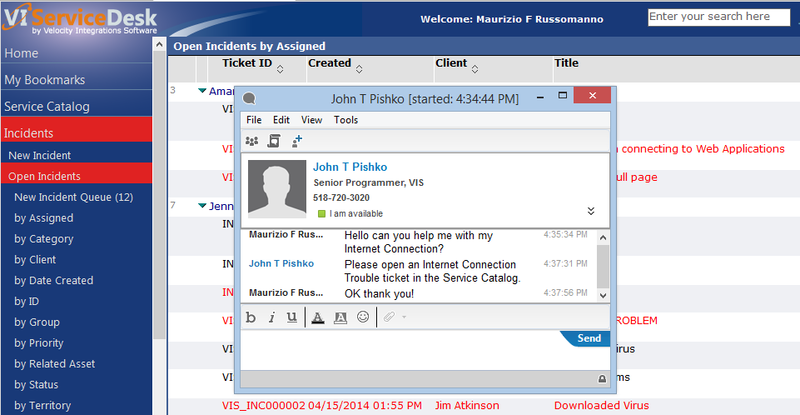 Email & Chat in the VI Service Desk - VIS, Inc. The VI Service Desk is designed to keep all affected users notified of any significant events and updates which have occurred on a ticket. This includes areas such ticket past due alerts, closure, reactivation, analyst assignment, escalations, service level agreement milestones and much more. If a user does not have access to the Service Desk interface, he or she can simply send an email to the Service Desk which will be converted into the appropriate ticket type (based on configured workflow rules) and automatically assigned for resolution. Emails can be sent from any ticket with all replies to those emails automatically logged on the originating ticket. This is very useful in building a well documented work history and saving time trying to locate relevant emails from your inbox. Quickly begin a live chat from a view or ticket to receive or deliver real time information. Live chat requires the use of IBM Sametime/Instant Messaing.